Apartments in Farmhouse in Maremma countryside just minutes from Scansano and a few miles from the sea. The cottage recently renovated is set in the countryside surrounded by the distinctive landscape of Maremma. The natural sand bottom pool is available to guests. The house consists of 4 apartments and 1 room Guests may take advantage of the B & B service. Around the pool are sun beds and loungers to enjoy the relaxation of the Tuscan countryside. 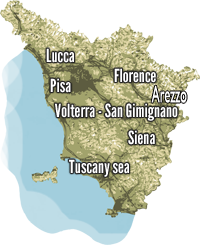 Less than 1 hour by car are within Montalcino, Siena, Grosseto, Follonica, Rome is about 2 hours drive. Pitigliano, Massa Marittima can be reached along the wine route through the countryside. About 10 minutes away from the Scansano is famous for its wine, 20 minutes, relax at the spa of Saturnia and only 30 minutes to enjoy the beautiful beaches of Maremma. Guests also enjoy the wide open spaces where you can eat outside. Price includes: breakfast, bed linen and towels, utilities (water, electricity, gas, heating), final cleaning, Breakfast, free use of swimming pool 5,5 x3m hmax 1m, heating, end of stay cleaning, weekly linen change, use the pool. Free parking inside the property free of charge. Free wifi internet. Digital terrestrial TV and satellite access. Children 0-2 years free in room with parents.